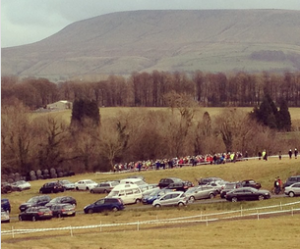 The frost went away and the rain tried its very best to stop for the races at Waddow Hall just outside Clitheroe. A cracking tough course and a large field made it an event to remember. Thankfully the heavy rain that we endured setting the course up on Friday had pretty much gone on Saturday. Many thanks to all that helped on Friday, epic springs to mind. Big thanks to Dave & Laura from Sportsunday who braved the elements and helped out all day. Waddow Hall proved an excellent venue and the staff couldn’t have been more helpful and keen to see the grounds being used to stage the cross races. 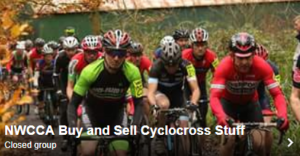 We ran this as a Go Cross event to encourage women to try their hands at racing, 21 ladies signed on which was fantastic to see and for 30 minutes they were cheered and encouraged round a challenging course. Bex Rimmington led from the off and was chased by Alison Mitchelmore (Velocake) and Jane Nolan (Clitheroe BC), Bex looked strong throughout the race and took a comfortable win, a good battle for second ended with a strong lap from Jane to finish in front of Alison. C. King. Images sponsored the event and Physiofusion added massage vouchers for the winners pot. A great race and C King Images has already pledged their support for the race next year. Youths raced the same course as the ladies and from the comments it was enough for their legs, the fastest boys just managing to ride the course in under 7 minutes. Strong rides from Matthew Walls (Velocity RT), Fabian Brennan (Salt Ayre Cog Set) and Joseph Peatfield (Bolton Hotwheels) so them finish 1st, 2nd & 3rd respectively. Alistair Leivers (BYCA) was first U14 boy with Lucy Horrocks riding a strong race to finish 1st U14 Girl. The main race and 115 riders lined up on the start line, a little over excitement from a few riders meant a slight delay in the start as they tried to set off before the whistle! A challenging a varied course was soon made harder as the course cut up becoming muddy and very slippy, proving a real test of skill and strength. Neal Crampton (Crosstrax) put in a very fast first lap to lead series leader Giles Drake (Team Elite) and Matt Lawton (Mac Wheelers), however Giles was soon on the front and edging out a gap to Neal & Matt, they managed to get close to Giles in the final lap but in the end it was another victory for the Team Elite rider. Many thanks to Hope Technology, C King Images, SIS, Physiofusion, Green Jersey and Going Dutch for sponsoring the event.